One of the very few albums dedicated entirely to a selection of works by Robert White, arguably the leading figure in that lost generation of English composers which came to maturity between Tallis and Byrd. 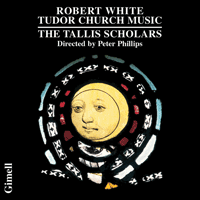 This recording is also available on the specially priced double album The Tallis Scholars sing Tudor Church Music – 2. Robert White (c.1538–1574) was arguably the leading figure in that lost generation of English composers which came to maturity between Tallis and Byrd, in the middle of the sixteenth century. Along with Robert Parsons and William Mundy, White formed a school within a school, whose musical instinct was to look back to the Catholic style of Tallis’s youth (a style they had all but missed) while putting it to the service of Elizabeth I’s Protestant Church. The result is an idiom which is rare in Tallis, who showed himself prepared to jettison the old ways, and unknown in Byrd. To us it has a particular, almost nostalgic appeal: the polyphonic lines still unwind slowly, the scoring is still spacious, the cadences archaic; yet the phrases themselves are more highly organized than in music from the 1520s and ’30s, their expression more direct and poignant. Like every composer active in England in the early years of Elizabeth’s reign, White was forced to make stylistic compromises as a result of the Reformation; and it is in the ingredients of these compromises that his individuality lay. Unlike Tallis, Sheppard and Tye, and although he was younger than them, he rarely wrote music with English words. The little Anglican music he did write was, like much of that by Parsons and Mundy, protracted and thoroughly polyphonic, coming close at times to sounding like exercises in Franco-Flemish imitation. His Latin motets, by contrast, are at once more modern and more old-fashioned: the five-voice Lamentations, which show White’s Latin style at its most advanced, contain little free polyphony, but rather expansive, often non-aligned homophony – yet are scored for the almost defunct choir of treble, mean, countertenor, tenor and bass. Even in his settings of the Hebrew letters which precede each verse and were traditionally written in abstract counterpoint (a method followed by both Tallis and Byrd in their settings of the Lamentations), White’s melodies seem to have been conceived in organized blocks, often repeating at the unison or octave instead of the fifth; often moving in parallel thirds, sixths or tenths: a half-way, individual style, neither exactly old nor new. One can only guess for whom he wrote these potentially contentious and vocally demanding pieces. He seems never to have been formally attached to the Chapel Royal, the obvious recipient of them, though it remains highly probable that he was asked to contribute to their work, especially after 1569 or 1570 when he became Master of the Choristers at Westminster Abbey. Before that, in his brief career, he was a chorister and later one of the cantores at Trinity College, Cambridge (1555–1562); Master of the Choristers at Ely Cathedral – where he succeeded his father-in-law Christopher Tye (1562–1566); and probably Master of the Choristers at Chester Cathedral (c.1566–c.1569) before moving to London, where he died of the plague in the disastrous epidemic of 1574. Although White seems to have spent much of his life working to the north of the capital, his Will states that he left property of some substance in Sussex. This kind of biographical non sequitur should make us cautious of concluding that he never worked at court: it is perfectly possible that, from his Cambridge days, he regularly visited London and always kept in touch with developments there. Elizabeth I not only permitted Latin-texted music to be sung in the Chapel Royal, she seems actually to have encouraged it. In this atmosphere a number of composers developed what is now called the Psalm-motet – often a complete Psalm set in a varying mixture of polyphony and homophony, each writer experimenting with the style as he thought fit. Caught again between old and new, the idiom of this extended motet could go either way: forward towards the consistently syllabic settings of the imitative Franco-Flemish motet, and the more homophonic Protestant anthem, scored for some combination of soprano, alto, tenor and bass (SATB); or back in resembling the pre-Reformation votive antiphon, in that its full-choir sections, characterized by high treble scoring, are punctuated by several duet and trio sections. In the two Psalm-motets, Portio mea and Exaudiat te Dominus, and the Magnificat included on this disc, White clearly intended to look back. Of the three, the Magnificat is the most conservative: perhaps an inevitable consequence of White’s decision to follow a tradition of settings of this canticle which had originally evolved from John Taverner’s six-part version. White copied Taverner (as did Parsons and Mundy in their Magnificat settings) in using a basic choir of treble, mean, two altos, tenor and bass, which is sub-divided for some of the verses but includes a triple gimell of two trebles, two means and two basses at ‘Esurientes’. (Much of the treble part, as at ‘Esurientes’, is missing and has been reconstructed by Sally Dunkley.) Between the three magnificently spacious full-choir statements (‘Et exsultavit’, ‘Fecit potentiam’, and ‘et in saecula’) the ebb and flow of trios and quartets is carefully handled. The influence of Taverner’s mature style is audible at, for example, ‘Sicut locutus est’, where the plainchant appears in the mean, with the two alto and tenor parts intertwining beneath it. Portio mea (a section of Psalm 119) and Exaudiat te Dominus (Psalm 20) equally suggest the old antiphon idiom. Portio mea is less varied in its scoring than Exaudiat te Dominus, and is chiefly notable for its astonishing ‘Amen’. It falls into two sections, each a trio building to a full choir of treble, mean, alto, tenor and bass. The ‘Amen’ which concludes the second of these is one of the repertoire’s most original explorations of the principle of the ‘false relation’ or dissonant third, built on a four-note figure which constantly turns in on itself. Although Exaudiat te Dominus, one of White’s most impressive works, does not employ the treble voice, it makes up for it with some imaginative and unusual redistribution of the voices. Beginning with a trio for mean, alto and bass (which culminates in the most ornamented of archaic cadential passages) the music proceeds to a five-part full section for mean, alto, tenor and two basses. This is in turn succeeded by a gimell for means and basses, and then a gimell for altos and tenors which moves by imitation into the final passage, now for seven voices MAATTBB, a summation of all the richness of scoring which has gone before. The three remaining pieces show White writing in a more modern idiom, even though it is underpinned by a strong sense of tradition. In all three the almost syllabic setting of the texts allows for the use of close imitation; in all three the harmonic background moves faster than it did before. This is especially obvious in Regina caeli and the Christe qui lux es settings where the cantus firmus chant, quoted strictly throughout, is given in two-beat units instead of the more old-fashioned four. Regina caeli, a setting of the standard votive antiphon text, is a rare example in White of music for men’s voices only (AATTB with the chant in the second tenor). Christe qui lux es III and IV are both alternatim arrangements of the text, traditionally used as a hymn at Compline, which asks God for protection in the coming night. The first of the two recorded here (White wrote four in all) carries the chant in the treble part; the second quotes it in the tenor. For mastery of a restricted idiom, the polyphonic verses of these two settings must rank amongst the most sublime achievements of the century. Robert White (v.1538–1574) fut sans doute la figure dominante de cette génération perdue de compositeurs anglais dont la maturité se situe entre Tallis et Byrd, au milieu du XVIe siècle. Avec Robert Parsons et William Mundy, White forma une école à l’intérieur d’une autre, dont l’instinct musical était de revenir au style catholique de la jeunesse de Tallis (qui avait failli leur échapper) tout en le mettant au service de l’Église protestante d’Élisabeth Ire. Il en résulte un style rare chez Tallis, qui se montrait prêt à s’écarter des voies anciennes, et inconnu chez Byrd. Ce style exerce sur nous un attrait particulier, presque nostalgique: les lignes polyphoniques se déploient toujours avec lenteur, la distribution des voix garde son ampleur, les cadences restent archaïques. Cependant, les phrases elles-mêmes sont beaucoup plus organisées que dans la musique des années 1520 et 1530 et leur expression est plus directe et poignante. Comme tout compositeur en activité en Angleterre au début du règne élisabéthain, White fut contraint à des compromis stylistiques du fait de la Réforme; et son originalité réside dans les éléments de ces compromis. À l’inverse de Tallis, Sheppard et Tye, et bien que plus jeune, il écrivit rarement de la musique sur un texte anglais. Le peu de musique anglicane qu’il écrivit cependant fut, comme souvent chez Parsons et Mundy, très longue et entièrement polyphonique, se rapprochant parfois d’exercices d’imitation franco-flamande. En revanche, ses motets en latin sont de facture à la fois plus moderne et plus ancienne: les Lamentations à cinq voix, où le style latin de White apparaît à son plus haut degré, comportent peu de polyphonie libre, mais une homophonie plutôt expansive et souvent non-alignée (en d’autres termes, avec des accords où les syllabes ne sont pas chantées en même temps). Elles sont cependant écrites pour une forme de choeur pratiquement révolue, composé de TrMCtTB, c’est-à-dire treble (soprano I), mean (soprano II), counter­tenor (dans cet enregistrement la partie est confiée à deux voix, l’une masculine, l’autre féminine), tenor et basse. Même dans la mise en musique des lettres hébraïques qui précèdent chaque verset et qui était traditionnellement écrite dans un contrepoint abstrait (méthode adoptée par Tallis et par Byrd dans leurs mises en musique des Lamentations), les mélodies de White semblent avoir été conçues sous forme de groupes organisés, se répétant souvent à l’unisson ou à l’octave plutôt qu’à la quinte, et se mouvant souvent par tierces, sixtes ou dixièmes parallèles: style personnel, à mi-chemin entre l’ancien et le nouveau, sans être totalement l’un ou l’autre. On ne peut que deviner à qui étaient destinées ces pièces vocalement exigeantes et sujettes à controverse. Il semble que White n’ait jamais été officiellement attaché à la Chapelle Royale, destinataire évident de ces pièces, bien que sa contribution ait été très probablement sollicitée, en particulier après 1569 ou 1570 lorsqu’il devint magister choristarum (maître de choeur) à l’abbaye de Westminster. Auparavant, durant sa brève carrière, il fut choriste puis l’un des cantores au Trinity College de Cambridge (1555–1562), magister choristarum à la cathédrale d’Ely – où il succéda à son beau-père Christopher Tye (1562–1566), et probablement magister choristarum à la cathédrale de Chester (v.1566–v.1569), avant de s’installer à Londres, où il mourut de la peste durant la terrible épidémie de 1574. Bien que White semble avoir passé la majeure partie de sa vie professionnelle au nord de la capitale, son testament indique qu’il laissa des biens de quelque importance dans le Sussex. Pareil illogisme biographique ne devrait pas pour autant nous faire conclure qu’il ne travailla jamais à la cour. Il est tout à fait possible qu’à partir de l’époque où il résida à Cambridge il se rendît fréquemment à Londres et fût constamment informé de ce qui s’y passait. Élisabeth Ire permit non seulement que soit chantée à la Chapelle Royale de la musique sur des textes latins, mais elle semble avoir en fait encouragé cette pratique. Dans cette atmosphère, un certain nombre de compositeurs développèrent ce que l’on appelle à présent le motet-psaume – souvent un psaume complet mis en musique selon un mélange variable de polyphonie et d’homophonie, chaque compositeur se livrant à des expériences de style selon son gré. Pris à nouveau entre l’ancien et le moderne, le style de ce motet étendu pouvait emprunter l’une ou l’autre voie. Soit il allait de l’avant en se rapprochant des mises en musique constamment syllabiques du motet imitatif franco-flamand et de l’anthem protestant plus homophonique, écrit pour quelques variantes de la combinaison SATB; soit il se tournait vers le passé en ressemblant à l’antienne votive telle qu’elle était avant la Réforme. Dans celle-ci, les sections pour le choeur au complet, caractérisées par les parties hautes de treble, sont ponctuées par plusieurs sections en duo ou trio. Dans les deux motets-psaumes, Portio mea et Exaudiat te Dominus, et dans le Magnificat du présent enregistrement, White avait visiblement l’intention de se tourner vers le passé. Le Magnificat est le plus «conservateur» des trois, résultat peut-être inéluctable du fait que White choisit de suivre une tradition de mises en musique de ce cantique dont la version à six voix de John Taverner était à l’origine. White imita Taverner (comme le firent Parsons et Mundy dans leurs mises en musique du Magnificat) en employant un choeur constitué à la base de TrMAATB (treble, mean, altus I et II, tenor et basse), qui se subdivise pour certains versets mais comporte un triple gimell pour deux trebles, deux means et deux basses sur «Esurientes». (La partie de treble, comme sur «Esurientes», a partiellement disparu et a été reconstituée par Sally Dunkley.) Entre les trois sections avec choeur complet, d’une magnifique ampleur («Et exsultavit», «Fecit potentiam» et «et in saecula»), le flux et le reflux des trios et quatuors font l’objet d’un usage attentif. On perçoit l’influence du style abouti de Taverner sur, par exemple, «Sicut locutus est», où le cantus planus (mélodie de plain-chant) apparaît dans la partie de mean avec, en-dessous, les voix d’altus I et II et de tenorqui s’entrelacent. Portio mea (section du psaume 119) et Exaudiat te Dominus (psaume 20) évoquent tous deux l’ancien style de l’antienne votive. Portio mea présente une moins grande variété dans la distribution des voix que Exaudiat te Dominus et se remarque essentiellement par son étonnant «Amen». L’oeuvre se ramène à deux sections, chacune faite d’un trio conduisant à un choeur complet de TrMATB. L’«Amen» qui conclut la seconde section constitue dans le répertoire l’une des explorations les plus originales du principe de la «fausse relation» ou tierce dissonante, élaborée à partir d’une figure mélodique de quatre notes tournant sans cesse sur elle-même. Dans Exaudiat te Dominus, l’une des oeuvres les plus impressionnantes de White, une redistribution des voix inhabituelle et imaginative compense le fait que la voix de treble ne soit pas employée. La musique commence par un trio pour MAB (qui culmine dans les plus ornés des passages cadentiels archaïques), puis passe à une section complète composée de cinq voix (MATBB). Celle-ci est ensuite suivie d’un gimell pour means et basses, puis d’un autre pour alti et tenores qui conduit par imitation au passage final, avec à présent sept voix (MAATTBB), récapitulation de toute la richesse de composition manifestée auparavant. Les trois autres pièces montrent un style plus moderne de l’écriture de White, reposant toutefois sur un solide sens de la tradition. Dans les trois cas, la mise en musique presque syllabique des textes permet d’avoir recours à l’imitation serrée et le fond harmonique avance plus rapidement que dans l’ancien style. Cela apparaît très clairement dans Regina caeli et dans les mises en musique de Christe qui lux es où le cantus firmus, cité de bout en bout de manière stricte, est donné en unités de deux mesures au lieu des quatre plus traditionnelles. Fait rare chez White, Regina caeli – qui met en musique le texte classique de l’antienne votive – est dévolue aux seules voix d’hommes (AATTB, avec le plain-chant confié au tenor II). Christe qui lux es III et IV sont deux arrangements alternatim du texte qui sert traditionnelle­ment d’hymne à complies et demande à Dieu protection pour la nuit à venir. La première des deux versions enregistrées ici (White en écrivit quatre au total) confie le cantus planus à la voix de treble, la seconde à celle de tenor. De par leur maîtrise d’un style retenu, les versets polyphoniques de ces deux pièces comptent parmi les réussites les plus sublimes du siècle. Robert White (um 1538–1574) ist wohl der führende Vertreter einer vernachlässigten Generation englischer Komponisten, die Mitte des 16. Jahrhunderts zwischen Tallis und Byrd heranreiften. Zusammen mit Robert Parsons und William Mundy begründete White eine Schule innerhalb einer Schule, deren musikalische Haltung sich zu dem stilistischen Habitus der katholischen Liturgie, wie er in Tallis’ frühen Jahren gebräuchlich war, zurückwandte, aber sich gleichzeitig an den Anforderungen der Anglikanischen Kirche unter Elisabeth I. orientierte. So entstand eine Tonsprache, die bei Tallis, der das veraltete Idiom bereitwillig über Bord warf, selten und bei Byrd gar nicht zu finden ist. Auf uns übt diese Haltung einen besonderen, beinahe nostalgischen Reiz aus: die polyphonen Linien entwickeln sich allmählich, der Satz ist noch immer weit ausladend, die Kadenz-wendungen wirken altertümlich. Und doch lassen die einzelnen Wendungen eine komplexere Struktur erkennen als die Musik der ersten drei Jahrzehnte des 16. Jahrhunderts, eindringlicher und ausdrucksvoller. White war wie jeder andere englische Komponist während der ersten Regierungsjahre Elisabeths I. gezwungen, mit stilistischen Kompromissen auf die Forderungen der Reformation einzugehen. Und eben im Umgang mit diesen Kompromissen liegt seine Individualität begründet. Im Unterschied zu Tallis, Sheppard und Tye, und obwohl er jünger als sie war, vertonte er selten englische Texte. Der geringe Anteil an geistlicher Musik mit englischem Text ist, ähnlich wie bei Parsons und Mundy, durchweg polyphon und durch eine gewisse Weitschweifigkeit gekennzeichnet, und manchmal klingen diese Werke wie Übungen in franko-flämischer Vokalpolyphonie. Die lateinischen Motetten hingegen zeigen ein moderneres, aber gleichzeitig auch altmodisches Gepräge: Die fünfstimmigen Lamentationen, mit denen White hinsichtlich der lateinischen Vertonungen einen Höhepunkt seines Schaffens erreicht hat, weisen zwar einen geringen Anteil an freier Polyphonie auf, zugunsten einer vom Rhythmus der Sprache her bestimmten freistimmigen Homophonie, fordern aber doch einen Stimmverband, wie er zu jener Zeit kaum noch gebräuchlich war, Sopran, ‘Mean’ (vom Stimmumfang zwischen Alt und Sopran), Contratenor, Tenor und Baß. Sogar die Vertonungen der den einzelnen Strophen vorangestellten hebräischen Lettern, die traditionell in abstraktem Kontrapunkt gehalten waren (eine Tradition, der auch Tallis und Byrd in ihren Vertonungen der Lamentationen folgen), scheinen bei White in durchgearbeiteten Einzelbausteinen gesetzt zu sein, wobei die Einsätze oft im Primabstand und der Oktave anstatt der Quinte erfolgen und die Stimmen häufig in parallelen Terzen, Sexten oder Dezimen geführt werden. Stilistisch befindet er sich damit auf einem eigenen Weg, sowohl zurück als auch nach vorn gewandt, weder ausgesprochen modern noch konservativ. Man kann nur Spekulationen darüber anstellen, für wen er diese potentiell provozierenden und technisch anspruchs­vollen Stücke schrieb. Offiziell scheint er sich nie der Chapel Royal, dem augenscheinlichen Empfänger dieser Werke, angeschlossen zu haben. Nichts­destoweniger ist es doch wahrscheinlich, daß er Kompositionsaufträge für sie ausführte, besonders in den Jahren nach 1569 oder 1570, als er Master of the Choristers der Westminster Abbey wurde. Zuvor war er während seiner kurzen Laufbahn Chorknabe und später einer der Cantores am Trinity College in Cambridge (1555–1562), dann als Nachfolger seines Schwiegervaters Christopher Tye Master of the Choristers der Ely Cathedral (1562–1566) und wahrscheinlich in gleicher Position an der Kathedrale von Chester (ca.1566–ca.1569), bevor er nach London übersiedelte, wo er 1574 der katastrophalen Pestepidemie zum Opfer fiel. Obwohl White offenbar einen großen Teil seines Lebens in Regionen nördlich der Hauptstadt arbeitete, läßt sich aus seinem Testament schließen, daß er doch einigen Besitz in Sussex hinterließ. Diese biographische Ungereimtheit sollte uns der Aussage, er habe sich nie in höfischen Diensten befunden, mit Skepsis begegnen lassen; es ist sehr wohl möglich, daß er von Cambridge aus regelmäßig London besuchte und die dortigen Entwicklungen stets im Auge behielt. Elisabeth I. gestattete der Chapel Royal nicht nur, Musik mit lateinischen Texten aufzuführen, sie ermunterte sie offensicht­lich sogar dazu. In dieser Umgebung entwickelte eine Reihe von Komponisten das, was wir heute als Psalm-Motette bezeichnen; dabei wurde meist ein ganzer Psalm in einer wechselnden Folge von polyphonen und homophonen Teilen vertont. Das heißt, die Komponisten experimentierten mit den stilistischen Möglichkeiten, die sie für geeignet erachteten. Eingebunden im Spannungs-feld zwischen alt und neu konnte die musikalische Sprache dieser ausgedehnten Motetten sich in beide Richtungen entwickeln – entweder nach vorn in Richtung der durchwegs syllabischen Vertonungen der imitierenden franko-flämischen Motetten und des vorwiegend homophonen Satzes der protestantischen Anthems, angelegt für eine wechselnde Kombination der Stimmlagen Sopran, Alt, Tenor und Baß, oder zurück auf die Tradition der vorreformatorischen Votiv-Antiphon, bei der der vollstimmige Satz mit dem Hauptgewicht auf den hohen Sopranlagen immer wieder durch Trio- und zweistimmige Abschnitte unterbrochen wird. In den beiden Psalm-Motetten Portio mea und Exaudiat te Dominus sowie dem Magnificat hatte sich White eindeutig für den Blick zurück entschieden. Von diesen drei Werken weist das Magnificat die konservativste Haltung auf. Es ist dies wahrscheinlich die unvermeid­liche Konsequenz der Entscheidung Whites, hinsichtlich der Vertonung dieses Textes einer gewissen Tradition zu folgen, die ursprünglich von John Taverners sechsstimmiger Magnificat-Vertonung ihren Ausgang nahm. White folgte Taverner, ebenso wie Parsons und Mundy bei ihren Vertonungen, indem er als Basis einen Chor bestehend aus Sopran, Mean, zwei Altstimmen, Tenor und Baß verwendet und diesen bei einigen Versen aufteilt, wobei im “Esurientes” auch eine Passage im dreifachen Gimell-Satz mit zwei Sopranen, zwei Means und zwei Baßstimmen eingearbeitet ist. Ein beträchtlicher Teil der Sopranstimme, auch im “Esurientes”, ist verloren und wurde von Sally Dunkley rekonstruiert. Das Gleichgewicht der beeindruckend weit­räumig gesetzten vollchörigen Abschnitte (“Et exsultavit”, “Fecit potentiam” und “et in saecula”) und der drei- und vierstimmigen Teile wird sorgfältig gewahrt. Taverners reifer Stil wird etwa beim “Sicut locutus est” hörbar, wenn die gregorianische Melodie im Mean greifbar wird und die zwei Alt- und Tenorstimmen darunter ineinander verwoben werden. Die beiden Motetten Portio mea (aus Psalm 119) und Exaudiat te Dominus (Psalm 20) halten ebenfalls an der überlieferten antiphonalen Form fest. Portio mea weist weniger Abwechslung in der Satzweise auf als Exaudiat te Dominus und ist vor allem bemerkenswert wegen seines bewundernswerten Amens. Die Motette zerfällt in zwei Abschnitte, wobei sich in beiden Teilen der volle Chorsatz aus einem Triosatz entwickelt. Das “Amen” beschließt den zweiten Teil und ist eines der originellsten Beispiele des gesamten Repertoires, was die Behandlung des sogenannten Querstands betrifft, der innerhalb einer viertönigen Wendung erscheint, die beständig in sich selbst kreist. Obwohl in der Motette Exaudiat te Dominus, einem der beeindruckendsten Werke Whites, keine Sopranstimmen besetzt sind, findet sich hier doch eine ungewöhnliche und fantasievolle Stimm­verteilung. Ausgehend von einem Triosatz für Mean, Alt und Baß, der seinen Höhepunkt in einer kunstvoll ausgezierten archaischen Schlußwendung findet, mündet das Stück in die Fünfstimmigkeit (Mean, Alt, Tenor, zwei Baßstimmen). Es folgen daraufhin zwei Gimells, für Mean und Baß sowie für Alt und Tenor. Im imitierenden Satz mündet das Geschehen in die Schlußpassage, wo jetzt sieben Stimmen (MAATTBB) als Höhepunkt die Groß­artigkeit des Vorhergehenden zusammen-fassen. Die drei anderen Werke zeigen White in einer moderneren musikalischen Sprache, obwohl auch hier die starke Bindung an die Tradition spürbar ist. Die fast durchgängige syllabische Satzweise in diesen Stücken gestattet ein dichtes kontrapunktisches Gewebe, und in allen drei Stücken bewegt sich die harmonische Fortschreitung rascher voran als in der vorreformator­ischen Zeit üblich. Besonders gut läßt sich das im Regina caeli und in den beiden Vertonungen des Christe qui lux es beobachten, wo sich die durchweg wörtlich zitierte Cantus-firmus-Melodie im zweizeitigen Metrum bewegt, anstatt der früher üblichen vier Schlageinheiten. Die Motette Regina caeli, eine Vertonung des üblichen Votiv-Antiphontextes, ist ein seltenes Beispiel für die ausschließliche Verwendung von Männerstimmen im Werk Whites (AATTB, mit dem Cantus firmus im zweiten Tenor). Christe qui lux es III und IV sind beides Vertonungen, die der Alternatim-Tradition folgen. In der liturgischen Praxis ist diese Hymne Bestandteil des Stundengebets, und zwar der Komplet, wo Gott um Schutz für die Nacht angefleht wird. Das erste der hier eingespielten beiden Werke (White vertonte diesen Text ingesamt viermal) trägt die gregorianische Melodie in der Sopran­stimme, das zweite im Tenor. Auf Grund der meisterlichen Beherrschung der satztechnischen Aufgaben innerhalb eines so knappen Rahmens müssen die polyphonen Teile dieser beiden Vertonungen zu den kunstvollsten Leistungen der Musikgeschichte dieses Jahrhunderts gezählt werden.